I've got a few non-blogging projects going on right now so I don't have much time to post. It's unseasonably hot as well, even for the middle of summer, so I'm not inclined to be spending a lot of time over a hot stove anyway. I am still somewhat busy in the kitchen; I'm just not working on a lot that's new. Most of my time is spent making things that require little prep and few ingredients. That can be a bit of a challenge, and this Sunday I found myself with little in the pantry, less interest in going to the grocery store, and even less inclination to cook anything. I even decided that I would just order delivery and make a night of it. But as is often the case, I couldn't settle on a choice as I sorted through my stash of delivery menus (yes, I still have those). I knew I was going to get hungry and I didn't have anything prepared and I had no plan, which does not happen that often to me these days. I finally thought maybe I would just make my quick and easy tomato garlic sauce and cook up some whole wheat pasta, but even that seemed like too much effort for too little reward. But pasta seemed like a good possibility, so I started to think about other sauces I could use with it. And that's when the inspiration hit for pasta with peanut sauce. A quick mental review told me I had most of the ingredients that I needed. I even had a little bit of lime juice in the freezer. What I did not have was coconut milk. But I did have some unsweetened organic coconut flakes in the freezer that I was pretty sure would do the trick. I used twice the amount of water and added half a cup of the flakes and lit them soak while I got the rest of the ingredients together. I guess I made my own coconut milk! I decided not to strain it because I hadn't really soaked it long enough to get all of the coconut flavor out of the coconut shreds. The end result gave the sauce an interesting texture. I don't know if I would do it again, but it was not all bad. I had half of a red torpedo onion, cucumber, and cilantro. Those added just the right amount of crunch, texture and extra flavor to make for a satisfying dinner that took just minutes to make. Bring a large pot of water to a boil. Add half a pound of any long pasta (I used capellini because that is what I had on hand) and cook according to the package directions. Reserve a cup of the pasta water before draining. While the pasta is cooking, add half of a chopped red onion or half a bunch of scallions into a large bowl. 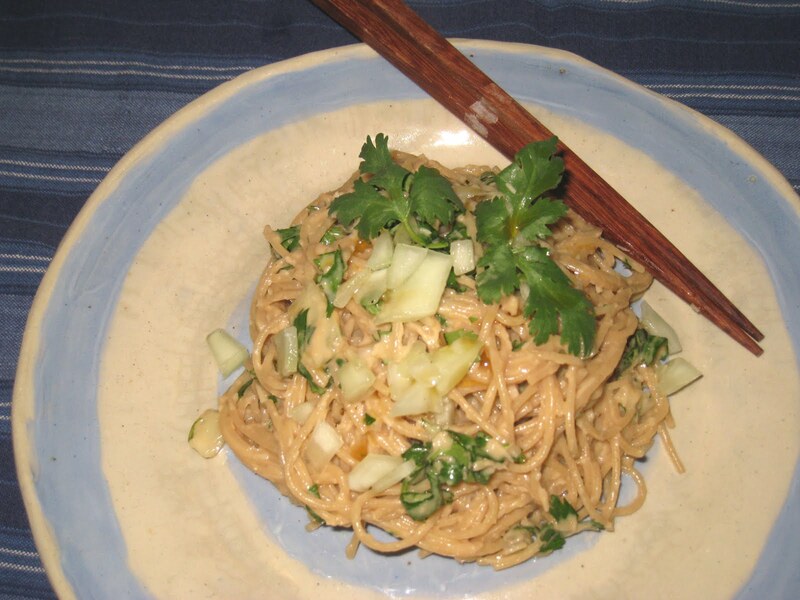 Add the cooked pasta, peanut sauce, cilantro, and a teaspoon of sesame oil. Mix gently until the peanut sauce and pasta are well combined. Top with chopped, seeded cucumber. Garnish with cilantro. Makes 4 servings.